Freeholder George Graham (center) introduces Assemblyman Parker Space (left) and Sussex Freeholder and Assembly Candidate Gail Phoebus. Photo by Jennifer Jean Miller. 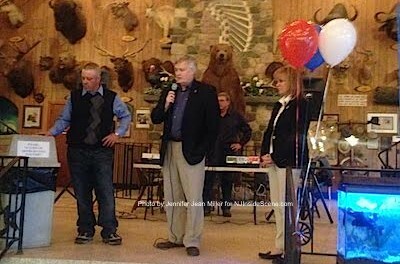 WANTAGE TOWNSHIP, NJ – Assemblyman Parker Space and his running mate, Sussex County Freeholder Gail Phoebus, held a special fundraising event on Friday, April 24 at Extreme Pizza at Space Farms. Supporters from throughout the county were in attendance, packing the building on the Space Farms’ property, where the Extreme Pizza Restaurant is located. Sussex County Freeholder George Graham introduced both Space and Phoebus, praising Phoebus for her work on the freeholder board and Space, who he described as a “wonderful man with a beautiful family.” Graham also recognized both of them for their commitments to the county, and their longtime family businesses within the county, Space Farms Zoo & Museum for Space and Farmstead Golf and Country Club for Phoebus. Phoebus explained as well that both she and Space hail from positions where they have longtime presences in the county, with both actively serving within Sussex County. She also said she and Space would both like to see Sussex County continue in a way where they can both have their individual businesses passed to their children. Space has served as a firefighter in the county for the Wantage Fire Department, including having been its chief, was on Wantage’s Township Committee, and served as mayor and deputy mayor. He was also a member of the township’s land use board. Space was on the Sussex County Board of Chosen Freeholders from 2010 through 2013, before heading to the New Jersey Assembly. On the Assembly, he serves on the Agriculture and Natural Resoruces and Labor Committees. He continues as well with his vocation as a farmer and owner of Space Farms Zoo & Museum and Extreme Pizza. Phoebus became a part of the Sussex County Board of Chosen Freeholders when she was elected in Nov. 2012. Like Space, she has been a lifetime resident of Sussex County. She started her public service work as one of the founding members of the Andover Township Economic Growth Committee. She also served on the Andover Township Committee, where she was also mayor and deputy mayor. As a member of the Sussex County Freeholders, Phoebus has been involved as a liaison with the Department of Human Services, County Clerk, Chamber of Commerce, Capital Projects, Child Advocacy Center and Sussex County Technical School Board of School Estimate. She and husband Bob, have owned and operated the Farmstead Golf & Country Club. Phoebus thanked her spouse and Space, his wife Jill, and they all thanked their families. 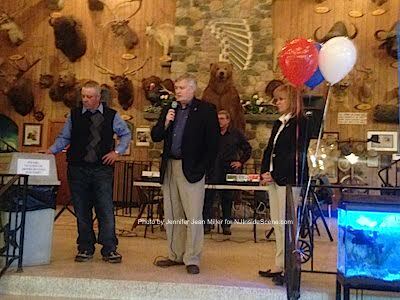 Jill Space took time to thank the sponsors and shared with the audience and Gail and Bob Phoebus, insights into being a spouse of a member of the assembly. 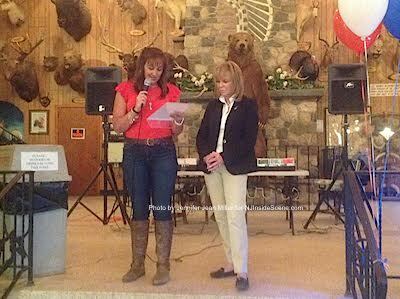 Jill Space (left) and Gail Phoebus (right). Photo by Jennifer Jean Miller. During his moment at the microphone, Parker Space quipped that “someone wanted to be here tonight, but was stuck during her commute from Virginia.” Space was giving a nod to Marie Bilik, a candidate for assembly who has been attacking Space on social media, indicating he “was leading the charge” for the controversial solar project within the county, and also criticized Phoebus for her outspokenness about the failed solar project. At the same time, Bilik has been questioned for the legitimacy of her entry into the race, after having aired on social media among friends as having moved to Virginia, though she has also countered she commutes for work from Virginia to New Jersey and back on the weekends, while she maintains a residence in Green Township. NJ Inside Scene debunked Bilik’s attack against Space in an independent investigation. 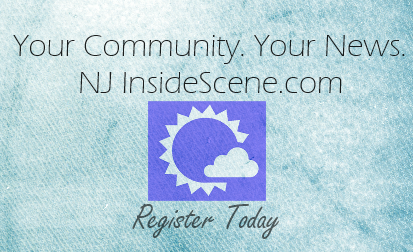 NJInsideScene.com uncovered from meeting freeholder minutes that freeholders Phil Crabb and Richard Vohden, along with Sussex County Administrator John Eskilson, were instrumental in delivering information about the solar project from meetings they had attended and reported it back to the rest of the freeholder board. Click here to read our story about this topic.